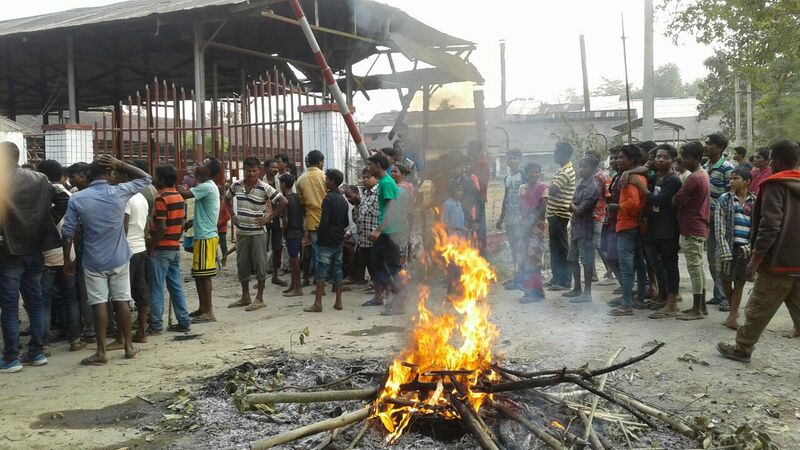 Tea workers staging protest in Golaghat on Wednesday. At least eight tea plantation workers were injured at Bogidhola tea estate in Golaghat district of Upper Assam on Wednesday after the owners fired upon a group of protesters. The incident took place at the tea estate when a group of the workers went to meet the owners of the garden demanding bonus which had been kept pending, police said. “We went to the house of the owner inside the garden to meet them for bonus. The owners, Sudhir Roy and Samit Roy, fired at us from their gun and pistol. Five people received bullet injuries while several others were also injured while escaping from the spot,” said one of the workers. Later, the tea garden workers laid siege to the owners’ house and blocked the roads in protest. “Five tea estate workers received bullet injuries while three others received other injuries while escaping from the scene. We have rescued the two owners of the garden and seized their licensed weapons which were used to fire upon the workers,” said a police official. “The situation is under control now and we are investigating the matter,” the official added. The labourers of the garden had been demanding 14 per cent bonus since October. However, the garden authorities agreed to pay only 8.33 per cent bonus and subsequently released it. The labourers were, however, adamant on their demand for 14 per cent. .Oppression on the garden workers, as often as not, leads to labour unrest, leading to conflict with the management. On February 11, 2005, around 250 labourers beat up Rupak Gogoi, the owner of Govindapur tea estate in Golaghat district and later burnt him alive following a dispute over daily wages. Gogoi was the son of former State finance minister Late Jibakanta Gogoi, and the husband of former State Cultural Affairs Minister Bismita Gogoi. Planter Mridul Kumar Bhattacharya and his wife Rita at Konapathar Tea Estate at Bordumsa in Tinsukia district were also burnt to death in December, 2012.